Text: Saori Hashiguchi. 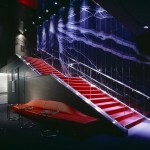 As you enter into the building, there is a spacious entrance hall (photo). 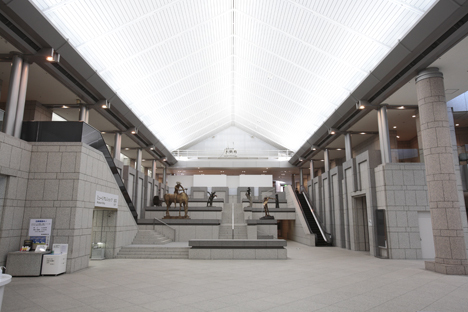 Various events are held in this space called “grand gallery.” It functions as a place of art exchanges and cultural exhibitions. It was originally established as a pavilion of Yokohama Exotic Showcase 89 and it was officially opened on 3rd November in 1989. It provides a restaurant, a café, a museum shop, a lecture hall, an art gallery, a citizen and children’s atelier which holds lectures. There is also an information center providing resources including an image source bank, 90000 art books, seven exhibition rooms. The museum’s collection includes over 9000 art pieces of domestic and international talents from Japanese artists around the Meiji period to Salvador Dali, Rene Francois Ghislain Magritte, Paul Cezanne and Pablo Picasso from late 19th century to the present age. Fulfilled photo collections (as Yokohama is one of the birthplace of photography) are introduced through the exhibition “YMA collection”. Other temporary exhibitions are held about four times in a year. We recommend having a break after viewing the exhibitions at the restaurant or the café serving special menus linking with temporary exhibitions at that time. And also the museum accomodates visitors coming with children to be provided several sevices such as renting baby carriages to accepting medical treatment at a nursing room. Younger than elementary school children get free admission, while younger than high school students are admission free every Saturday (with a Student ID). The public square of art in front of the museum becomes a relaxing place from kids to adults on holidays.